A lot of Christian leaders ignore the Almighty God gave hundreds of predictions to the prophet M. Nostradamus that relate directly and indirectly to the apostle Matthew's chapter 24 and many other critical biblical prophecies. This eye-opening book is a must for all religious leaders and Christians of every denomination. It is so because the M. Nostradamus' prophecies written in this volume will revolutionize the way many religious leaders interpreted the apostle Matthew's chapter 24. The prophet Nostradamus said many times that everybody can read his prophecies, but only the people of God should interpret them. However, it seems that almost all the writers of the Nostradamus' prophecies are unbelievers who have not mentioned much the Bible in their books. It is of a high importance for you to read in this book the Nostradamus' prophecies interpreted by a Christian man and whose meaning have kept hidden for more than 400 years. Those Nostradamus' prophecies relate to the next Third World War, famines, persecutions, the invasions of Israel, the beast (Antichrist), the false prophet, the profanation of the temple, the apostasy, the abomination that causes desolation, the rapture, the resurrection of the dead, the darkening of the sun, the shaking of heavens on October, the LORD's return, the great earthquake, the battle of Armageddon and the millennium. 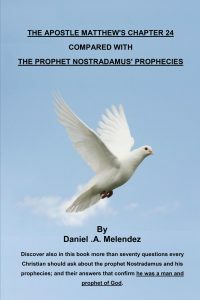 Religious leaders and Christians will be amazed when they discover the unknown Nostradamus' prophecies that the author (Daniel M) mentioned in the paragraph before and that connect with the apostle Matthew's chapter 24. Discover in this book many biblical references and details from the Nostradamus' prophecies that confirm Christians will have to pass for the tribulation period. Discover the sequence of events for the last seven years and seventy-five days before the Messiah's return. Know the approximate date of each event. Discover several Nostradamus' prophecies that affirm that the LORD will return on May and not during the feast of the trumpets. After reading the comparisons between the apostle Matthew's chapter 24 with many Nostradamus' prophecies in this valuable book, you will find more than seventy questions that every Christian should ask about the prophet Nostradamus; and their answers that confirm M. Nostradamus was indeed a faithful Christian and prophet of God.